Peanuts are nutritional powerhouses. 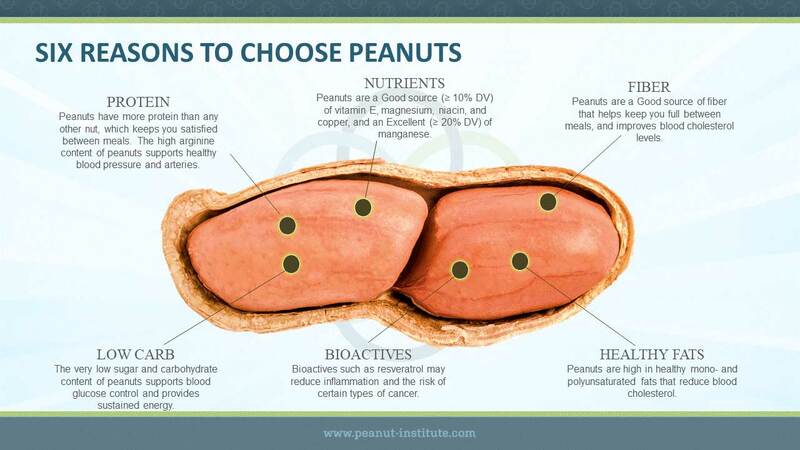 According to the Peanut Institute, there are six important reasons to choose nutrient dense peanuts. Fiber– both soluble and insoluble fibre in peanuts contribute, along with protein, to feelings of satiety. Fiberis also important for digestive health. Low Carbohydrate – Peanuts have little carbohydrate (natural sugar) content relative to their high protein and healthy fat content. That means peanuts have a very low glycaemic index/glycemicload. This is beneficial in the management of type 2 diabetes and for weight loss. Bioactives– peanuts contain plant substances beyond vitamins and minerals that have health benefits: phytosterols, polyphenols, flavonoids, arginine, resveratrol and other antioxidants. Healthy fats – Peanuts are a healthy high fat product; most of the fat in peanuts and peanut butter is unsaturated. The main fatty acid is oleic acid, the same as found in olive oil. The Peanut Institute is a non-profit organization that supports nutrition research and develops educational programs to encourage healthful lifestyles that include peanuts and peanut products. The National Peanut Board (NPB) is a farmer-funded national research, promotion and education check-off program. Each of the 10 major peanut-producing states has a grower Board member and an alternate representative.